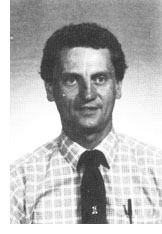 In 1986 Mike Olson continued his long years of volunteer work with the Peoria area youth in hockey and baseball. He has directed youth hockey clinics yearly for the past 15 years and has served two three-year terms on the Peoria Youth Hockey Board of Directors. In addition he has devoted his time to teaching Bergan and Richwoods hockey clubs, and this year is coaching the Peoria Bantams (14 & 15 year olds) travel hockey team. For 10 years Mike has coached the Fresh-Soph and Prep League baseball teams, and yet has reserved time to coach in the Von Steuben Little League Program for a four year period. After graduation from Richwoods High School, Mike attended Michigan State University where he lettered in hockey and baseball. Then he accepted an assistantship at Bowling Green State University which involved coaching responsibilities in hockey and baseball. When he returned to Peoria he formed and coached the Peoria Blades Hockey team for its life span of 11 years. Mike is a math teacher and varsity baseball coach at Peoria High School. He and his wife, Lauren Jo, have two children, Jennifer and Brian.